A couple of weeks ago we touched down in a place I had never been. 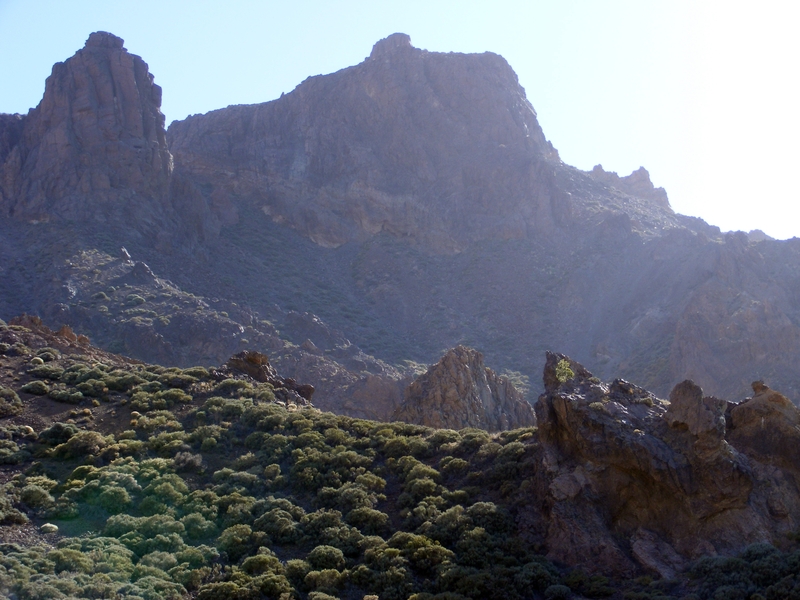 The shores of Tenerife, that beautiful volcanic island a couple of hours away from Spain, had only ever been a distant dream for a fleeting moment in times of heavy rain and high winds as I trucked up endless iced-over roads. Then, from great loss, came an opportunity to take a much needed break from the stresses and strains of the last twelve months. A chance to unwind, relax and enjoy life – a rare opportunity indeed. We packed in good time and set off as a family – yet another experience that had denied us for almost three years, indeed since the time myself and my partner Nyree (pronounced as you would, Marie – but with an ‘N’ ) got together. We’re like passing clouds in a night sky you see, one blown one way, the other only granted the barest of touches as it whisps by on ever more turbulent pressure. Me, being a creature of the night, I leave for work before Ree gets home from her day job and likewise, she’ll be gone long before I wake the next day. In essence, all we have are semi-conscious cuddles and the odd elbow in the ribs until my days off come around each week. That and scribbled post-it notes professing our love, or whatever the current talking point may be of the time. It has been so long, and we have become so used to it that we now both have it down to a fine art. Nyree will hear me come home, pet our Collie dog, Sammy, switch the kettle on and shove whatever the evening dinner was into the microwave to heat up. As soon as the miracle oven goes ‘ding! !’ Ree can then sleep, because she knows that’ll be the last of the major noise I make for the next two hours as I sit, eat and rid myself of the tensions of a nights trucking and innumerable road based muppets. My routine rarely deviates, I come in, sit and eat and as I wait for the natural digestion process to take me past the stage of explosion, I’ll be tapping away either immersed in Facebook or, more recently, on a mission to get back into the writing ‘zone’ that has slipped almost unseen from my grasp of late. In a way, we’re communicating, albeit it unspoken – more a knowing. This is in no way an ideal situation and, given what fate has thrown at us recently, it has tested our resolve to the limits. It was to this end that the decision was taken for us to take a holiday so when the time came, the journey over the hills to Manchester went very well. Excited, we arrived at the airport, the passing of many a year for all of us since the last such outing, way before our relationship had existed. I’d be lying if I said we were not excited, despite the already long day that we had all had. Our flight times were perhaps not the best, but all in all, a necessary concession to get away to the sun for awhile. After what seemed like an interminable wait, finally we boarded the plane and were soon thrust back into our seats as the engines wound up, catapulting the plane forwards at a simply awe-inspiring rate of knots. After a four hour flight we circled the island, unable to land on a direct run since the air space around the magnificent Mt. 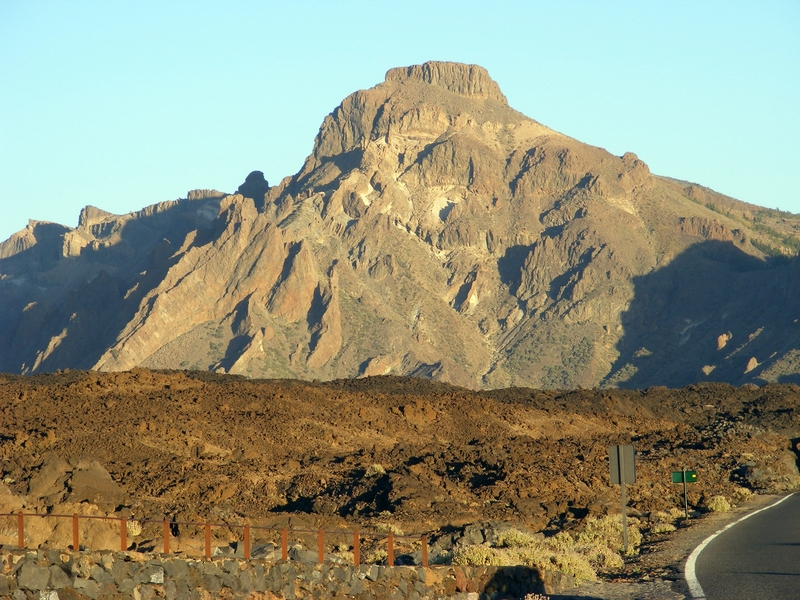 Tiede volcano at the centre of the island is a no-fly zone. An attempt to minimise air pollution and reduce contamination to the spectacular rock formations and lava flows that we were yet to see close up. With two flagging children and a sticky, windless heat hanging, one of the first things to hit me as we staggered outside with our cases was the smell of the air – of the sea. It is distinctive, unmistakeable and strangely calming. We had all been on the go for around fourteen hours by this time, getting up early to check everything, then check it again, and of course, check it again before we left. One of the things that never ceases to amaze me is a young adults desire for food. You would think, given that it was approaching 2 a.m. that the kids bodies would be in sleep mode, conserving energy and hence, not requiring copious amounts of sustenance – that’s where you’d be wrong. We checked into the hotel, just a short stagger from the drop off point luckily, already the perspiration formed on my brow, the pores of my skin in catatonic shock at the night-time 24 degree heat. Beer, I needed a beer, now. That notion alone took me by surprise, since I rarely drink back home. Bags dropped, our fist foray was to the end of the huge apartment building where, under bright lights and neon signs, was a small but effective mini restaurant – still frequented by passing trade even at that hour. It was a sight for sore eyes, and the ever desperate calls for food from the kids. Four burgers and chips, a couple of beers and two cokes later we’re feeling a little more chipper and ready to head back to the hotel fifty or so euros the lighter. The body is a strange and wonderous thing. Within hours of landing on this spectacular island, Ree decides that it’s ‘really hot’ and we’ll need an aircon unit to get to sleep. The downside is that its now almost 3 a.m. and not surprisingly, the ACME aircon salesman isn’t around. In a bid to get the kids to bed, not to mention find our own slumber, we compromise, opening the balcony louvre doors at both ends to create a passing ‘breeze tunnel’ and at least circulate what little blowing air came through. It worked, luckily. Anticipating a long, lazy lay in the following morning, my body clock had other ideas. Kerchiiing!! 8a.m. and I’m up, trying unsuccessfully to navigate my way around a relatively open plan apartment on around 5 hours sleep without making a sound. Imagine an elephant with cymbals – you get the idea. “We’re in Tenerife! !” I muttered to myself. The clearly irritated voice of our lass managing to make a whisper echo in the confines of the small apartment complex as I stood, scratching my head at the ludicrousness of the situation. And so, my daily ritual of reading in the morning, physically cursing my mangled body clock, struggling with day/night hours and a beautiful setting overlooking the mountains with the foreboding volcano on the skyline, became my much looked forward to respite. I sat, as the sun came up over the peak, sweeping around in an ever warmer arc, reading my kindle and watching the island awaken and I have to say, at those times, I felt as relaxed as I ever have. One of the things that crossed my mind at that point was – if I ever make retirement, this is how I’d like it to be. I don’t need a huge house, don’t need a fancy car but I’d settle for the warmth of the sun and a view like this each morning as I wake. 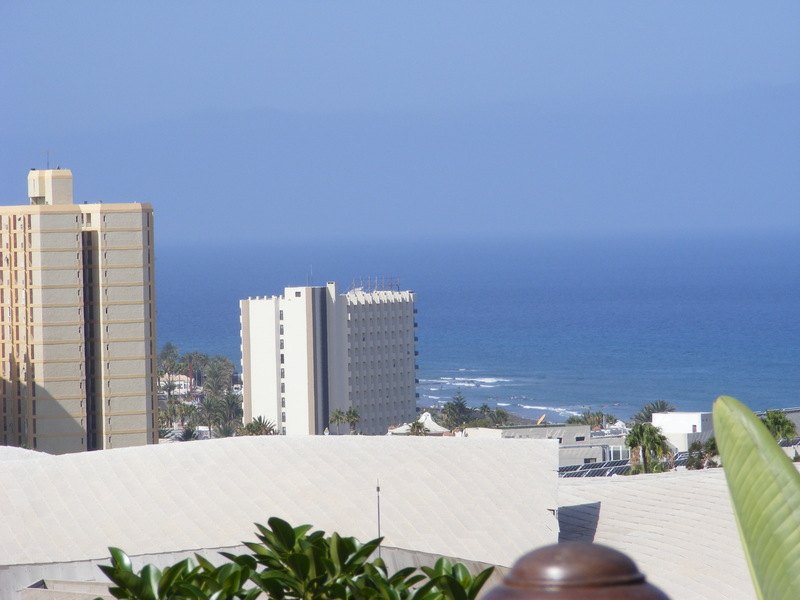 The all inclusive apartment complex featured a huge pool area, sunbathing areas, and a couple of bars fully staffed into the wee small hours. With the family awake a couple of hours later, after the long haul it had been to get here, we ventured out into the dazzling sunshine, daubed in factor 30 and all smelling exactly the same. Easy enough to recognise the folks that came in on one of the endless buses from the airport, because we all had that “What the hell do we do now?” expression compounded by the lily-white skin, previously devoid of any natural sunlight strong enough to induce even the palest of browns let alone anything resembling a tan. The kids made a bee-line for the breakfast bar, driven by insatiable desires for just about everything that wasn’t remotely healthy on the menu. I mean, ice-cream for breakfast… I’ll have a beer (well, I’m on holiday and it’s almost 11) and that became our reasoning for a week, pretty much. The ‘kids’ being young adults of 16 and 14 respectively, were given strict orders with regards to the bar. I’m a firm believer in allowing some responsibility and to their credit, they did still come and ask if they wanted something alcoholic. So we settle in, exploring the town and local shops, hunting for milk and sugar, which comes in a bag big enough to supply the hotel, let alone just for me, since the kids won’t touch tea any more than they would touch a ‘lesser mobile device’ hehehe. I felt kind of odd for the first day, as if I didn’t really belong, at a loss for what to do having struggled through the dilemma of taking or leaving my laptop and deciding that I’d leave it at home. I didn’t have work to prepare for, didn’t have emails to check, or ‘status posts’ to write. In essence, all I had to do was sit and watch the world go by. It’s a very odd sensation to be with someone and yet be so far away from them. At home, while Ree and I are very much together, we really couldn’t be further apart. We live in different time zones, different realms of day and night. We have our own responsibilities with our own two children respectively, we move in different social circles, hers close knit family and mine fragmented and often solitary save for the beep or ping of another tag. This epiphany hit me on day two, after we had toasted ourselves to the point of near cremation, the lure of the open air pool became to great to ignore. The uneasiness I had felt, the awkwardness of interacting socially, beyond the reasoned, work induced niceties of everyday home life began to evaporate as we rediscovered eachother once more. A little like dating all over again – but already knowing the outcome. The barriers we had each put up began to crumble and for a short time, the home life in England was forgotten, the grief and sadness put away in a box marked ‘open later’ and the stresses of a relationship in need of respite were granted at least a short stay of execution. The funny thing about alcohol is this, it has a way of dissolving inhibitions, of removing the awkwardness of life, the fear of rejection and the need to be ‘reserved’ as so many of the English tend to be. Now, I’m by no means a big drinker – which doesn’t mean I can’t hold it, I just choose not to drink, mainly because of my work requirements. I have to say, having a bar on tap, with whatever you want, as much as you can take – provided you can walk to the bar and walk away from it again, is far, far too great a temptation not to take up. I’d be lying if I said I didn’t take advantage but I didn’t once get blind drunk. It’s not my style, I need to be at least capable of reaction should the kids need me, or our lass needs help. That said, we did have a few nights chatting to other kids’ parents about this, that and nothing in particular as copious amounts of Vodka and Bacardi found their way to our table. In any other place, it would have been such an out of character thing for us to be doing and yet here – it seemed the most natural thing in the world. Day three saw us heading out to the volcanic centrepiece of the island, Mt. 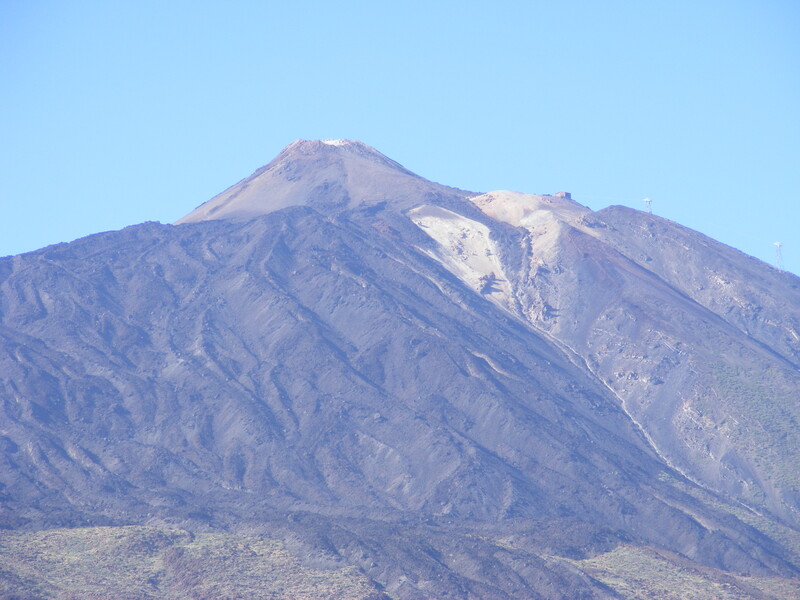 Tiede. It was my fascination with the stars that saw us heading up on the night time excursion, which began at four in the afternoon, a time when the sun made it still too hot to put bare feet to concrete. Luckily, the coach had aircon, though not the best as I was soon to find out from the protests of children and partner. Me, I was too in awe as we rose higher and higher up the majestic mountains, taking in the views and clicking away with my camera like some demented reporter having spotted an upcoming scandalous starlet. The huge coach groaned and whined it’s way up the snake pass of the mountain road, reminiscence of the classic film, The Italian Job sprang to the forefront of my mind as the sheer drops and spectacular views opened out the higher we went. From the bus window, and then at a resting ‘viewpoint’ half way up the mountain. This trip was the highlight of my holiday. I had known about it long before our time was due and looked forward to it from the cab of my truck. Now, here we were, heading up into what looked like country that had never before seen human feet – even though thousands have made this trip before us. The land looked primal in places, as if time had somehow forgotten it. Wild fires had scorched swathes of coniferous growth, pine trees with blackened stumps that miraculously managed to regenerate and grow once more when any normal tree would have simply died. 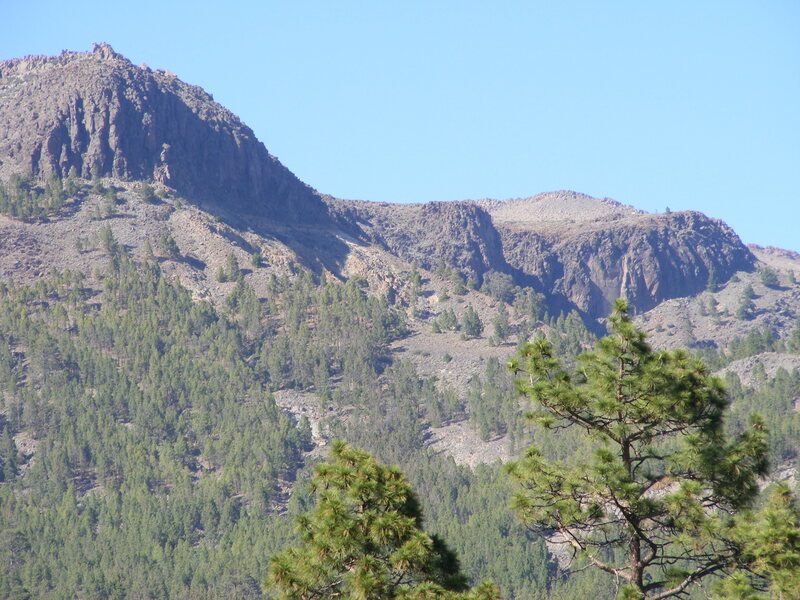 As we got higher, the trees fizzled out to reveal sun-baked chasms of molten lava rock formations, decades immortalised after cooling, having been ejected from the very bowels of the Earth in what was described as a major volcanic eruption back then. 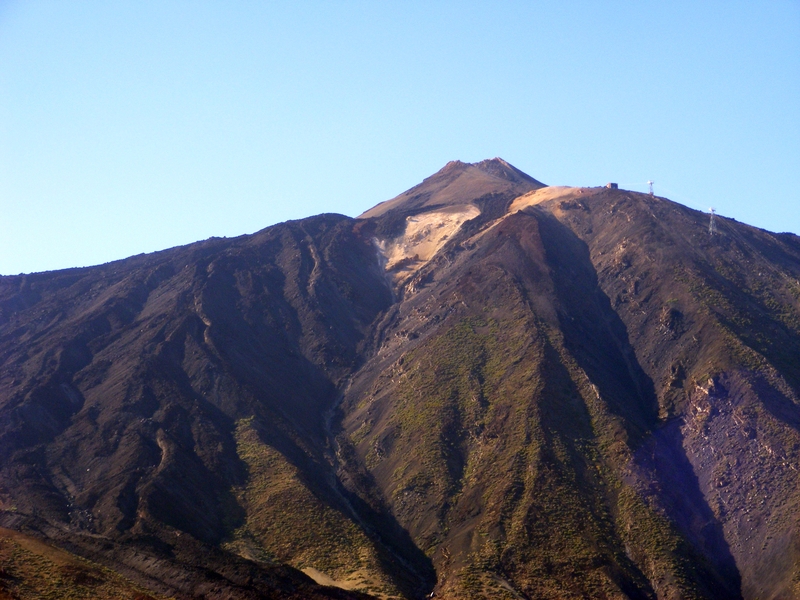 The volcano holds such immense power, such energy that somehow I could feel the closer I became. It was akin, if I were of a religious nature, to the feeling one would have when entering a grand cathedral, to be presented with the effigy of Jesus, I would think. I couldn’t take my eyes off the summit, itching to get up there and peer over the rim – not that it was going to happen on this journey, sadly. I’m quite a sad individual really, I guess. I take equal amusement from rocks and stars, both of which have fascinated me since I was old enough to gaze and collect. To imagine rock that has been on this Earth since before man took first steps is enough to send my mind into overdrive. We stopped about half way up the mountain at a restaurant come shop, much needed water and a chance to cool off, appeasing the rather annoyed kids with ice-creams and promises of “It’ll be worth it when you get there, honest” though they didn’t believe me. 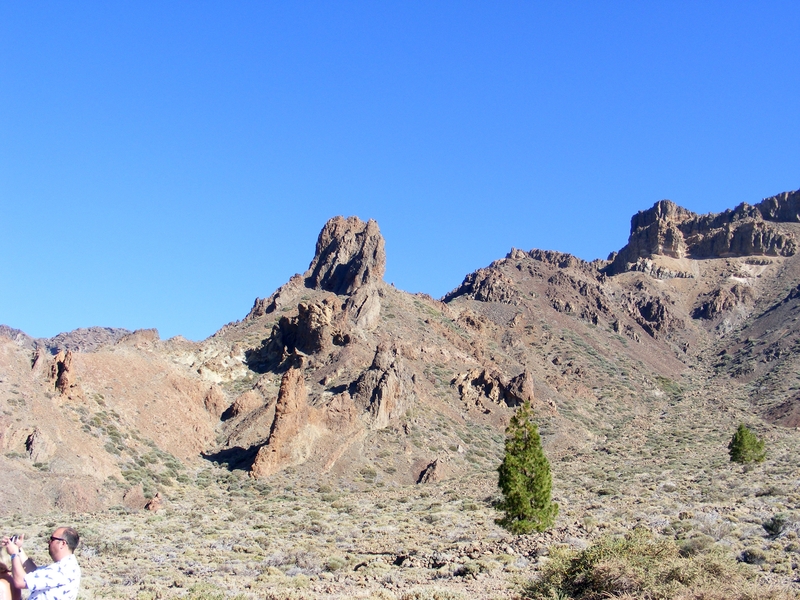 This was taken as we came around the mountains and it’s just possible to see Tiede on the far side there. 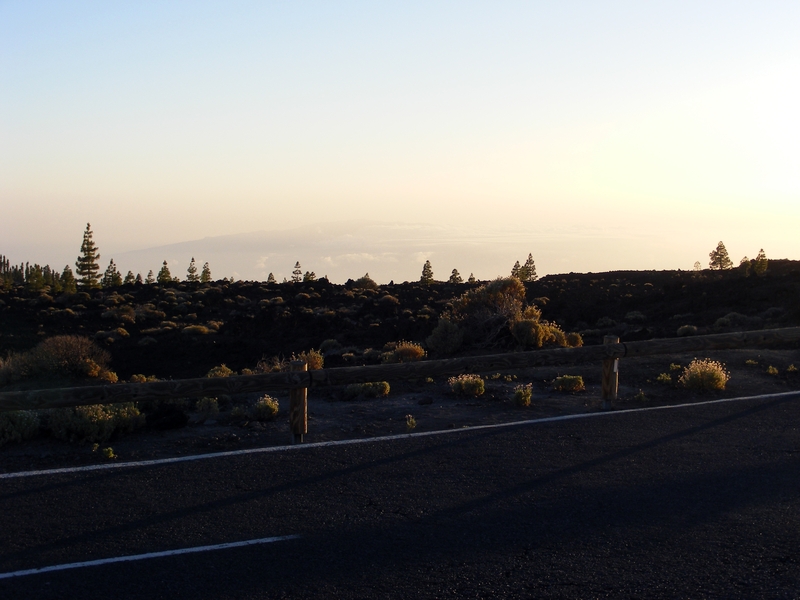 It’s difficult to get a sense of the sheer magnitude of the area as the volcano itself is approached through the actual lava flow of a previous volcanic eruption which has created a huge crater where a similar volcano once stood. There are billions of tons worth of lava ‘river beds’ clearly visible. Upon boarding the bus to rattle our way up to the peak side hotel/restaurant for an included meal – the venue being owned by the government and of course, a major tourist attraction – we settled into groups around nicely laid tables, admiring both the scenery of the location and the building itself, which was complimented by a small church just outside. The sun began to make it’s slow descent into twilight, bringing with it a welcome respite from the intense heat. We were later informed that the temperature had reached a whopping forty one degrees. The hotel restaurant was ornate inside, it had an air of prominence about it, classy decor and expensive marble floors – even the guests had made an effort at dressing to impress, so you can imagine their disdain as seventy sweaty, shorts and t-shirt clad tourists, gatecrashed their evening. The waiters fussed over the tables as I nodded my way through, catching up to the rest of the family. I’d been rock hunting as the group had settled in. I couldn’t help myself any longer, though it is frowned upon to take any of the lava off the volcano, just a tiny bit wouldn’t dent the enormous piles and gorges of the stuff scattered as far as the eye could see, and besides, given that it was still an ‘active’ volcano, my reasoning was that it would be quite possible in the future to replace the small piece of history I had stuffed into my pocket. I picked a little lump that resembled the volcano. My little bit of volcano. By the time we had all managed to get through the three course, set dinner which, while a little fancy for my palate, seemed to go down very well, we sat for awhile as the waiters arrived with bottles of Chardonnay to wash the food down with. The first course was a selection of breads baked in house, with prawns on the side and a small selection of other seafood, most of which the kids struggled to look at, let alone try. My partner and I are quite keen on seafood so promptly dug in. This was followed by what I think was a vegetable soup, though quite what the vegetables were, I have no idea. It certainly wasn’t a soup that I’d ever tasted before. On the premise that it was ‘healthy’ and remembering the copious amounts of vodka that I’d put away the night before, I struggled through it, dipping bread more than actual spoon. Again, the kids sniffed in defiance and refused point blank. Upon the arrival of the third course, which I think was tender cooked lamb, the lure of the meat, stripped local potato – which are extremely expensive in Tenerife apparently – went down a treat with all, as did the Coke still in glass bottles, something we don’t see so much in England these days. Fed and watered, we strolled outside as the sky began to darken, the first peep of the stars began to whet my appetite as to the spectacle to come. 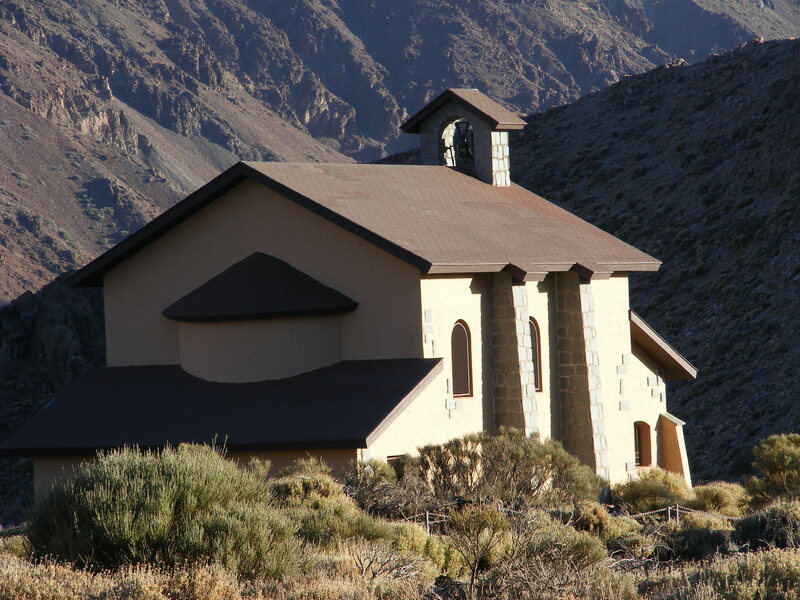 It gave us a little chance to go take a closer look at the chapel, which though sadly closed to public entry, was still a pretty little building in a very hostile environment. It looked lost, surround by the majestic rocky slopes. Huge boulders threatened to engulf the tiny chapel and I couldn’t help but wonder of the beauty of the ceremonies that might take place within those walls, despite my less than enthusiastic approach to religion. This photo was taken when we arrived, it would not have been possible to see by the natural light once the sun went down completely. After some more rock hunting in the surrounding area, a little nature-spotting in the way of bugs and creepies, not to mention a rather impressive and ferocious looking yellow and black spider, which sadly, my photographic capabilities managed to mess up the picture of, we boarded the bus for the journey back down the mountain to our ‘volcano view point’ in the absence of rising higher to the cable car base camp – which is only operational during the day and limited to 100 people to the summit. 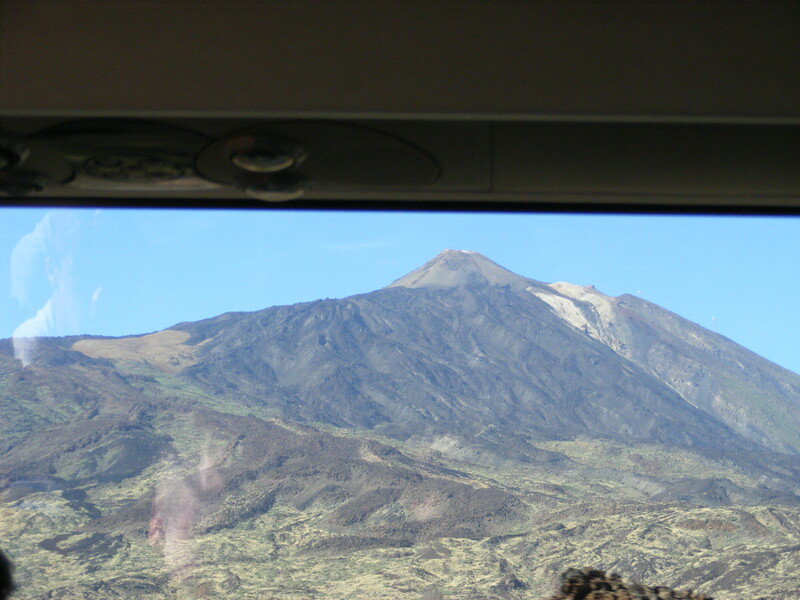 Armed with my digital camera on maximum exposure, I spent the entire journey clicking away at the awe-inspiring location, managing to snap off a few decent photos of the volcano and surrounding areas. 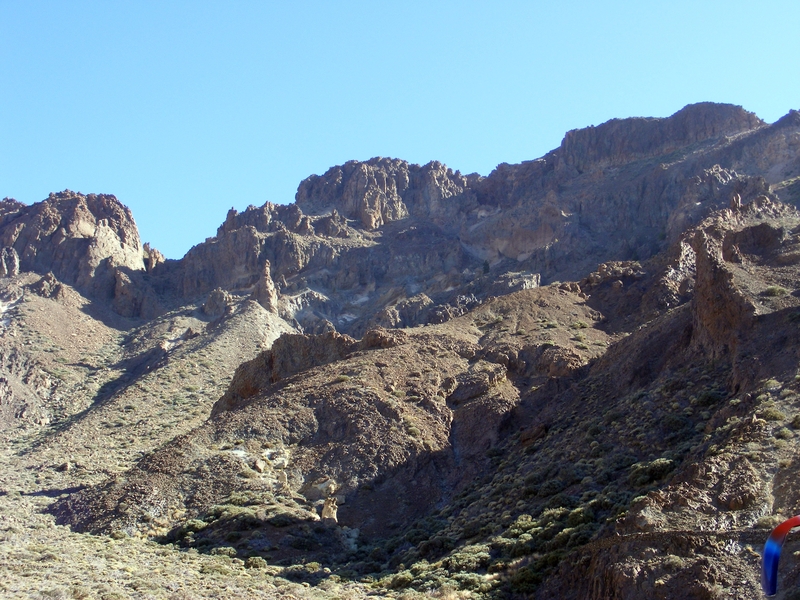 Our guide informed us that many a movie had been shot on these barren slopes and it is possible to see why. It is breathtaking and yet raw, a little like landing upon the surface of Mars, or stepping back tens of thousands of years to a primal age, long before humans walked the Earth. For me, it was an all enchanting place of destruction and beauty and easy to pick up on the dormant, destructive power that I know waits below the surface of that volcano still. The opportunity to do a little exploration overcame us all, I think, and we stealthily disappeared while the rest of the folk drank champagne, waiting for the darkness to come. 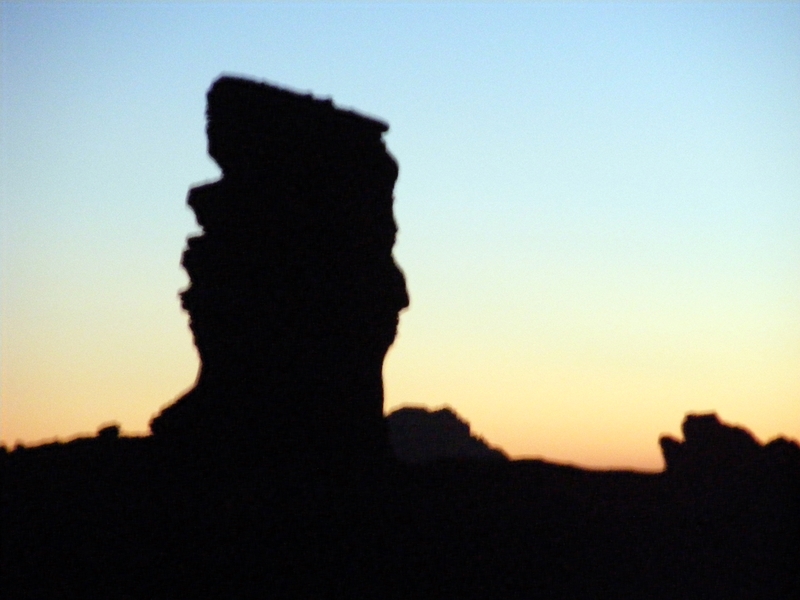 I’ve enhanced these images slightly, to bring out the details from the fading light. 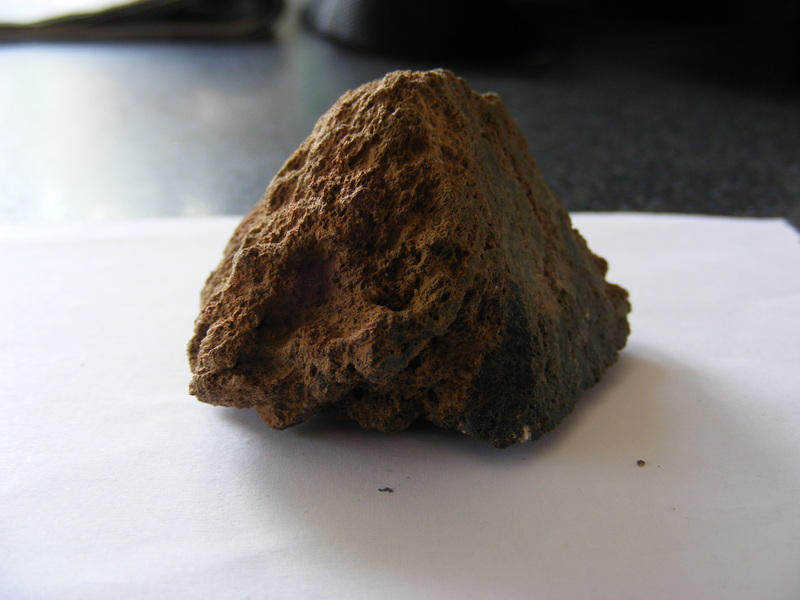 Yet more rock samples were collected, just a few little bits as momento’s of the day. A couple of glasses of champers later and feeling distinctly light headed due to the alcohol and the altitude, it was time for the finale. 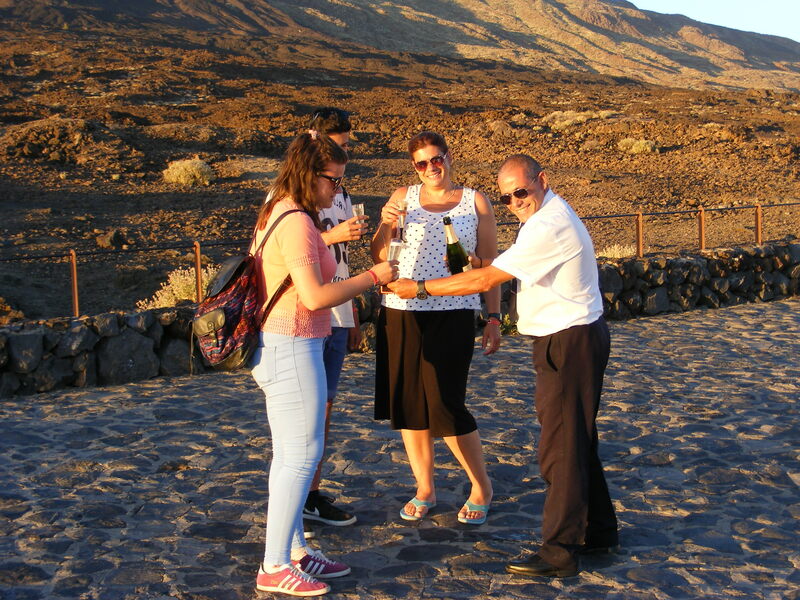 The bus was now a much less formal place to be as we said our goodbye’s to Tiede and made or way downwards to the last of our stopping points, a view point to see the galaxies as they revealed themselves with the setting of the sun. I managed to get a few fuzzy photos in the pitch black of the night sky. In the last of those four it is just possible to see no less than THREE planets. 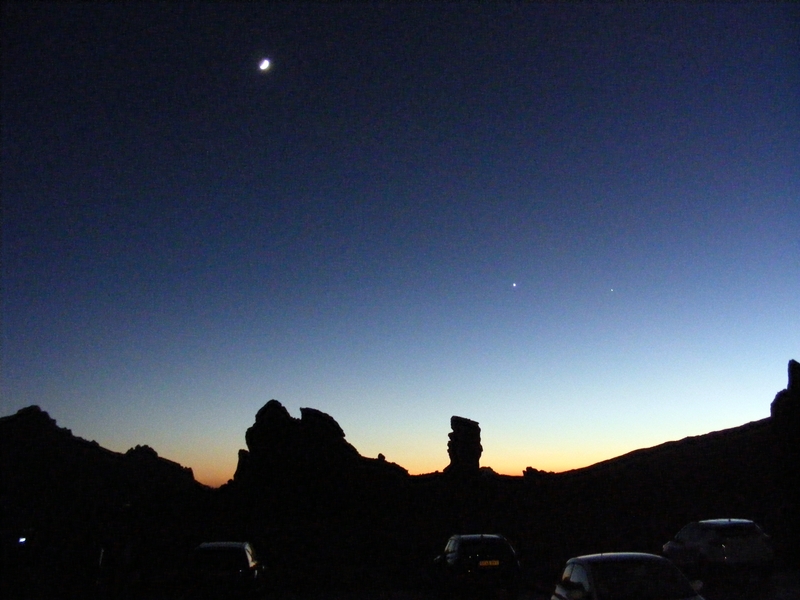 The Moon, Venus and Pluto, very feint but visible in what was a spectacular sunset. Overhead, a myriad of stars began to peep through and by the time we reached the final viewpoint, a veritable array of galaxies and star systems awaited eager eyes. Most of the group, I found out later, were star nerds like myself. Fascinated by the enormity and mystery of space. 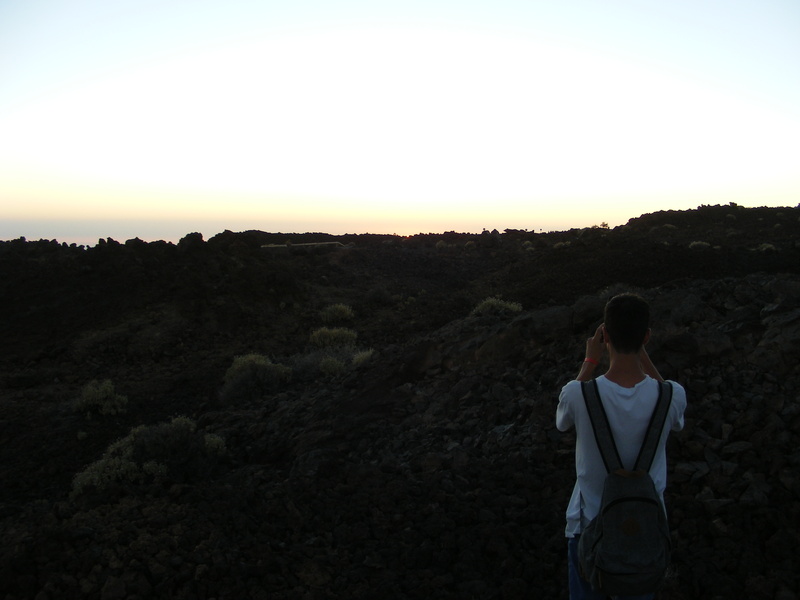 Our guide turned out not only to be well versed on the history of the volcano and Tenerife as a whole, but also extremely knowledgeable when it came to the constellations. Equipped with a military grade laser pointer, which I’m sure would have burned a hole clean through the average tough guy, she deftly pointed out the numerous birth-sign constellations, giving us a brief history of distances, mass and the other fascinating facts. The group, now ever so slightly sloshed, had a giggle as comments were quipped while gazing to the heavens as passing satellites were pointed out whizzing across the sky. We were fortunate to see not one, but two shooting stars in our short stay, which resulted in everyone staring with an ‘Ahhhhhh!’ as they streaked from view. I found the whole experience to be fascinating. I have memories and images from that trip that will stay with me forever. Even the kids seemed to be drawn to the sheer magnitude of the starscape and educational commentary. Needless to say with the impending return to the civilized world not far away, the journey back down the mountain was filled with impromptu versions of the various driving songs and at one point, almost the whole bus was banging out ‘Delilah’ by Tom Jones, as we wound our way back towards the first of the hotel drop-offs. Despite it being a very long day, and really quite exhausting, I felt accomplished at having experienced something I felt could be a once in a lifetime thing. With luck, I’ll have a chance to explore that particular setting again some day, but for now, I have this log to remind me. 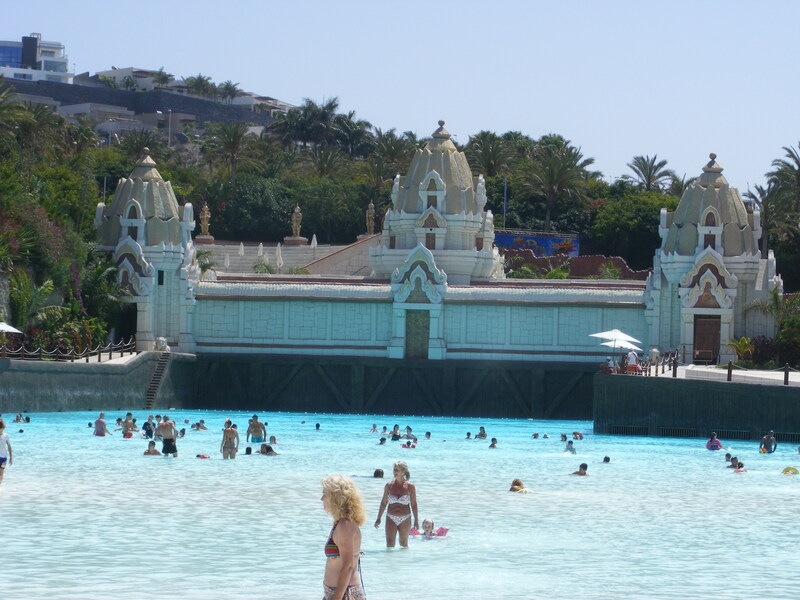 Day four would be a second trip to the much talked about Siam Park. This is a massive, themed water park set in the hills above the main resort and only around fifteen minutes ride from the hotel beach complex where we stayed. Tom and Holly, eager to get to grips with the rides, had wanted to go to the park earlier but it does take a little time to get settled in. 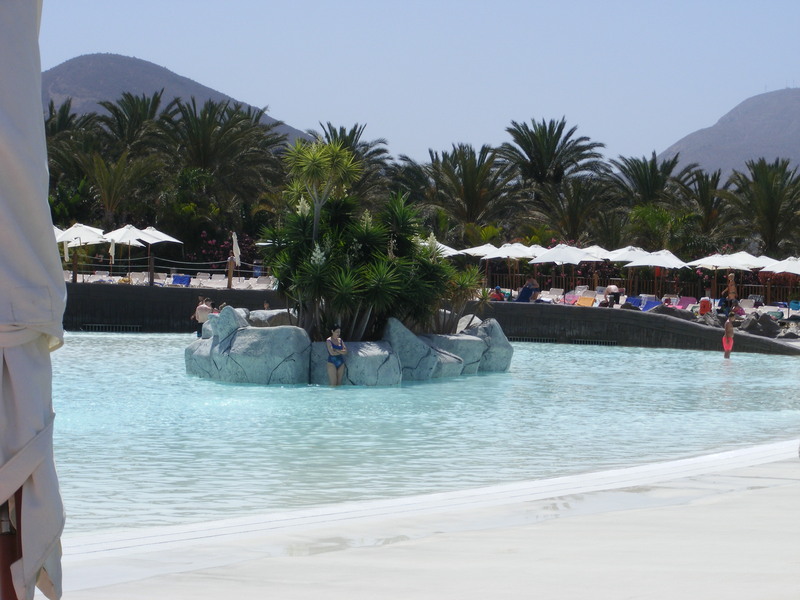 The plan was for the kids to go off and do what they wanted, while us oldies chilled out in the ‘Wave Pool’ attraction area which had stunning views inside and out over the sea as the sun shone. An excellent opportunity to get some relaxing sunbathing in. They even have a guy who comes through the sunbeds with a refrigerated beer dispenser on his back. I managed to get a few pictures of the park. The three oriental looking domes there are actually a huge hydraulic ram. 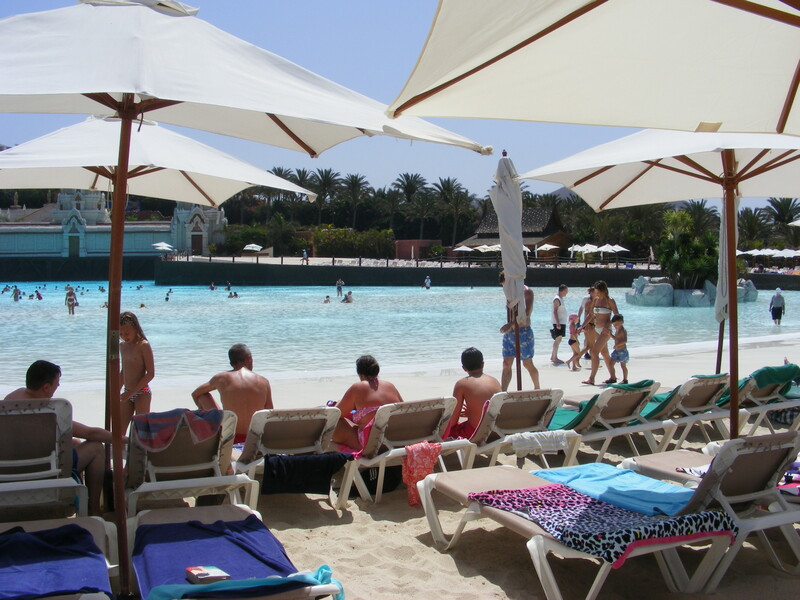 Every hour or so, it blasts out tidal waves which attract the swimmers to the pool area you see here, deceptively calm. It is quite an experience to behold and the first time you try it, you’ll be wondering what made you do it. The first time that wave, which must be at least 20ft high top to bottom, comes rolling away from those towers, your dinner makes a b-line for exit. Swallow hard, roll with it and feel the excitement of the moment as the force of the water carries you upwards. As the wave breaks, it’ll take the unsuspecting clean off their feet and even the after waves have some force behind them. The pool wafts out huge waves every few minutes or so for about a half an hour, then falls silent, waiting for it’s next victims. It is quite expensive at the park for meals and drinks, best, if you can, to secrete a couple of bottles of water into your bags though at peak times they do have bag searches as outside snacks are frowned upon. That said, it is a day to remember and we did that park twice, getting to explore the small shops as the kids went on ever increasing adrenaline rush rides. 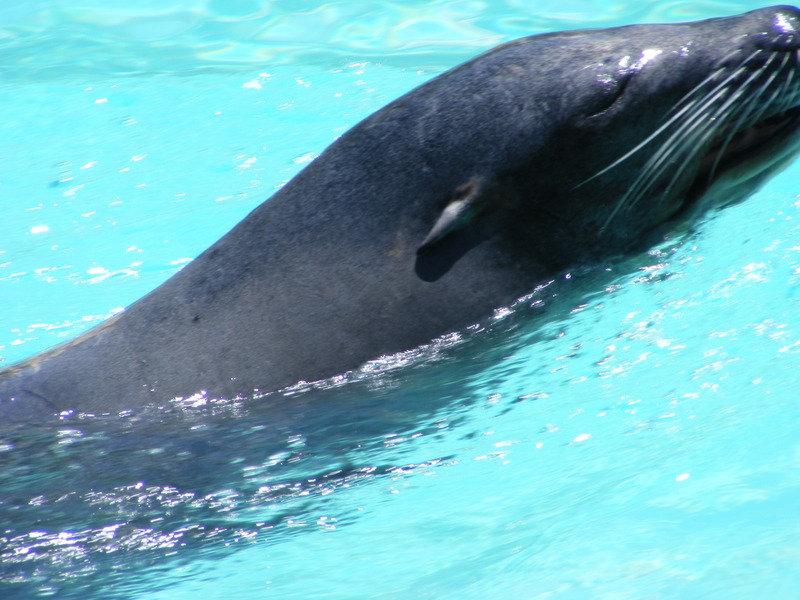 There is plenty of wildlife in the park, fish pools and seal lion enclosures, as well as a shark pool that you actually pass under on one of the rides. I did that one, the lazy river which included the rapids, see how brave I am? Hehehehe. 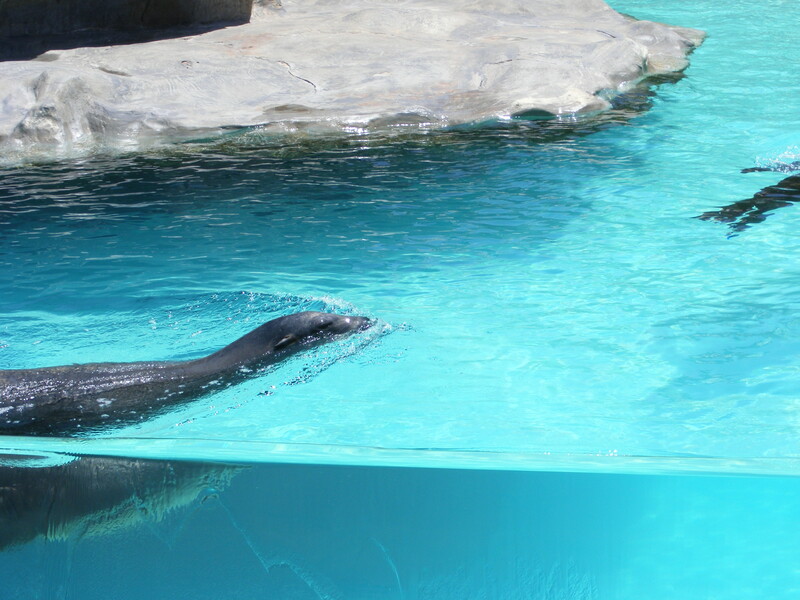 A couple of the Sea Lions doing their thing, oblivious to the crowds, it seems. After most of the day there, time to head back to the hotel, it was about time for the evening dinner spread, which usually consisted of several choices of main course ranging from pork steaks, to salmon or white fish, lamb or pasta with stuffed vegetables along with various other snack type options. A really impressive array of food was available all day, every day. 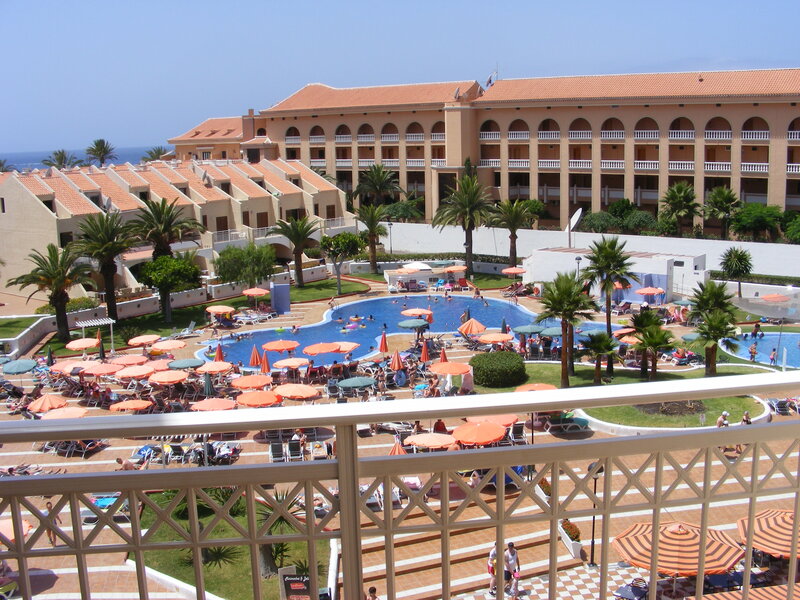 The resort was a 3* place, called the Family Garden Compostella Hotel but for the money, everything you needed to enjoy a good stay. One of my only main concerns was the road works directly outside – it seems they were pedestrianising the main drag outside the front of the hotel which, to my mind, they could have done off-season to spare the holidaymakers being woken up by drilling at around 730 a.m. each day. For us though, we kinda got used to it and after awhile they had moved far enough down the street so as it wasn’t so much of a problem. On the plus side, the beautiful white sandy beaches with water break walls to allow a serene dip in the sea were nothing short of stunning. 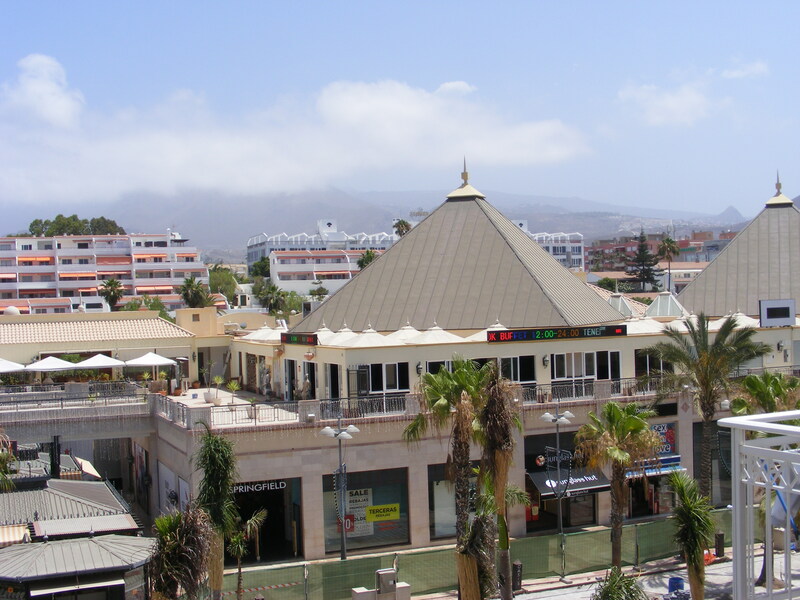 Ample shopping and duty free shops within walking distance. Various eateries and bars, though none that really caused any problems of a night time, from what I saw. 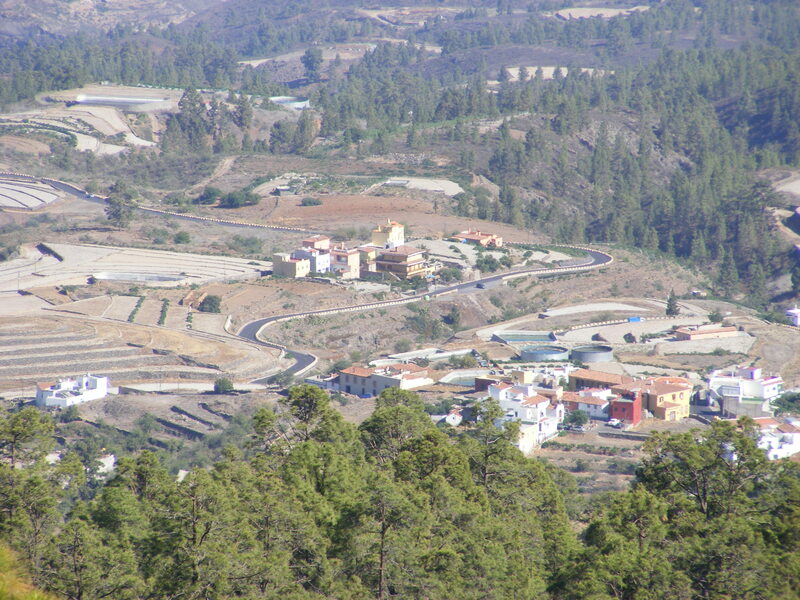 In closing this post then, I can heartily recommend Tenerife as a holiday destination. It is the most stunning island with good night life and beautiful beaches to be sampled. Our hotel catered for children too, with entertainments for them and even fashion parades from time to time, which pleased the ladies no end (and raised a gentlemanly eyebrow as the skimpy-clad models strutted their stuff, changing between steps) but enough of that. If I had the chance to go back, I’d jump at it, that’s what matters, and while it may not have fixed the differences in mine and my partners relationship with quite the optimistic outcome that was hoped for, it certainly gave us the break from the stresses that we all needed, even if it could never have changed fundamentally, who we were before we went. Wow, what mountains and a gorgeous night sky, glad you all enjoyed it! I do hope so. The view alone, not to mention the close proximity of the sea add the commanding mountains, I found utterly mesmerising. It was a beautiful place. I only wish it could have dispelled the inevitable burdens we returned to.